Civil security and public health officials in Montreal who have met with flood victims say that the most widespread health problem caused by the flooding is psychological distress. "It is actually the biggest problem. Twenty-five per cent of people met had symptoms of distress," said Richard Massé, the director of Montreal's public health agency. "We are going door-to-door to meet with people and refer them to professional services.…This is something that is very important.… We need people to be aware that they don't need to stay alone." Massé said that, fortunately, there has been no increase in the number of cases of gastroenteritis, which can often occur during flooding. Four people had to be treated for carbon monoxide poisoning. Of the 1,000 inspections carried out so far, 60 homes received a "code red" rating. 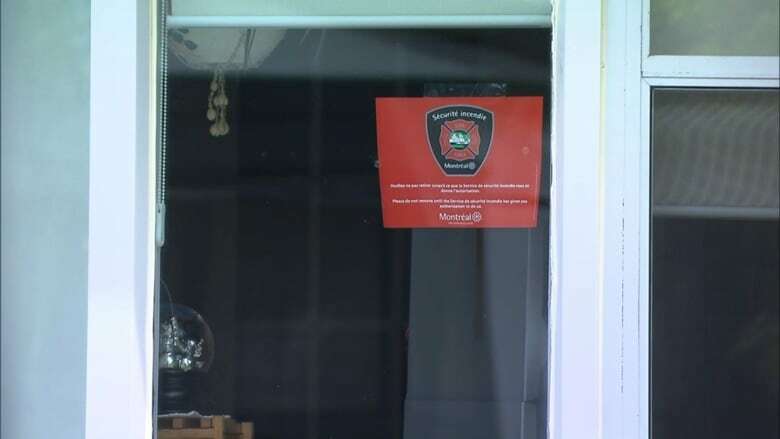 "The red code is for people who should not stay inside the house," said Louise Desrosiers, chief of fire prevention at the Montreal Fire Department. "They can go there to do some construction, but they should not live inside their house … for their security and their health safety too." 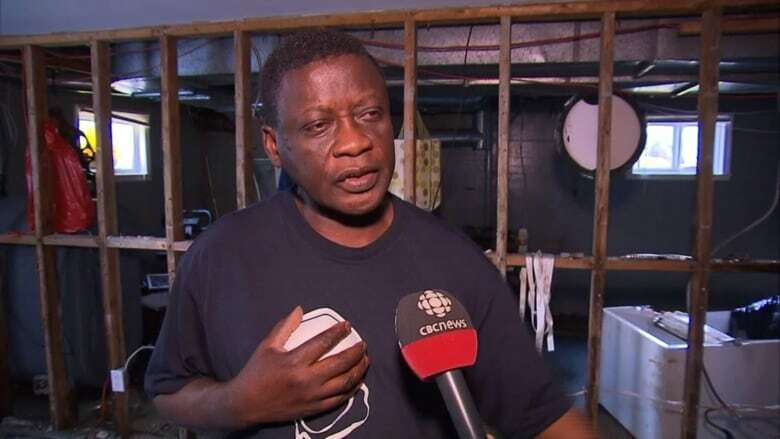 One of those property owners whose home was deemed code red is Kofi Karikari, who told CBC the frustration is mounting as the days go by. "I need a house. I can't live in a hotel, I have to go to work. In two weeks, I have never been to work. They have given me some time [off], but it's going to expire on Monday. On Monday I have to go to work," Karikari said. The code-red homes have all been evacuated, and Desrosiers said the team of inspectors — which includes a fire inspector, building inspector, police officers and an electrician — gives all homeowners a safety kit. "They give each citizen a kit with a mask and gloves, and explain how to put on the mask and why you have to wear it in a home that's been flooded." Flood victims returning home should always wear rubber boots, gloves and a mask, and should not touch materials that came into contact with floodwaters with their bare hands. Parents should also prevent their children from playing in parks that were flooded, in case there is still debris on the ground. Massé said people whose homes were flooded have to beware of mould. "This can cause respiratory problems or accelerate the development of asthma. It is very important to address this problem," Massé said. About 500 homes received a code yellow rating, which means that minor repairs are required, but people can continue to live inside the homes. The other 500 homes were rated code green, which means it's safe for people to return inside. Desrosiers said that businesses, daycares and a school were also inspected. Next week, more inspectors will be added to the team to meet with as many people as quickly as possible. If flood victims have any questions about steps to take once they go back home, they can call 311. Test the smoke detectors and carbon monoxide detector. Look for the presence of mould. Document all the damage (photos, written log). Make sure food and water are safe before consuming it. The Red Cross will provide $4 million to households affected by the flooding in Quebec and Ontario. Eligible registered households will each receive $600 in the coming days. Close to $3 million of the total being provided will go to more than 5,200 households in Quebec, while roughly $1 million will go to 1,600 households in Ontario. 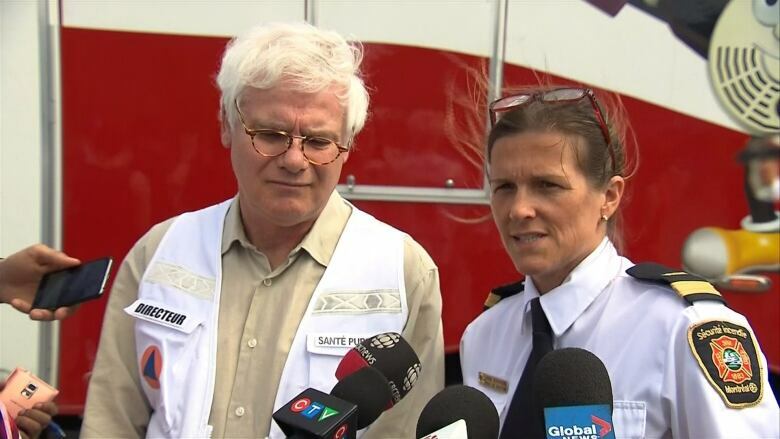 "Thanks to the generosity of Canadians, partners and businesses, the Red Cross is able to provide direct financial assistance to flooded or evacuated families," Conrad Sauvé, president and CEO of the Canadian Red Cross, said in a statement. "In the weeks to come, the Red Cross will provide recovery assistance for the people most affected by this disaster, based on their needs." Record rainfall in April caused extensive flooding across Quebec and in parts of Ontario. 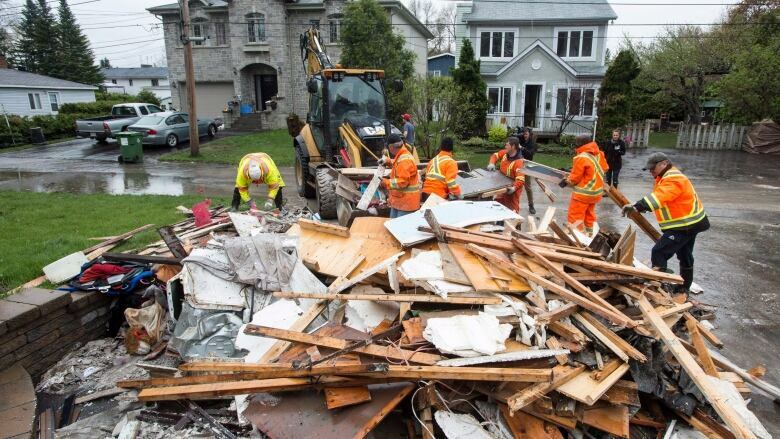 On Wednesday, Quebec's Liberal government increased the amount of money residents can receive in compensation for damage to their flooded homes to a maximum of $200,000. Under the new rules, all owners or tenants of homes affected by the spring flooding in April and May are eligible for compensation.